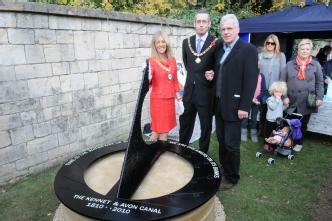 A NEW sculpture to commemorate the 200th anniversary of the Kennet and Avon Canal was unveiled last weekend. The sculpture is on the canal towpath near the Horseshoe Walk end of the Widcombe Flight, and was commissioned by Bath and North East Somerset Council, in partnership with the Widcombe Association, the Kennet and Avon Canal Trust and British Waterways, Alan Tilbury tells us. "This is just something else for people to see as they walk along the canal. We are looking to improve the whole walkway and get more people walking along it." "We are looking forward now to the next 200 years and we are hoping to improve all the other structures along the canal. This project is providing heritage for the future and it is all about looking forward and letting people enjoy it. "It is creating something for the future and bringing the community together in the mean time." "We are determined that our waterways should thrive as working navigations, for this is at the root of their heritage. We want waterways that are vibrant with boat movement, rather than extended linear boat parks."